So when you think "penguin", you should be imagining a slightly overweight penguin (*), sitting down after having gorged itself, and having just burped. It's sitting there with a beatific smile - the world is a good place to be when you have just eaten a few gallons of raw fish and you can feel another "burp" coming. NOW comes the hard part. With this image firmly etched on your eyeballs, you then scetch a stylizied version of it. Not a lot of detail - just a black brush-type outline (you know the effect you get with a brush where the thickness of the line varies). THAT requires talent. Give people the outline, and they should say [ sickly sweet voice, babytalk almost ]"Ooh, what a cuddly penguin, I bet he is just stuffed with herring", and small children will jump up and down and scream "mommy mommy, can I have one too?". This was originally drawn by Larry Ewing. The basic penguin has since mutated into many forms. Recently, some ancient writings from the far future have shown up, and has been translated to French by Emmanuel Eckard. 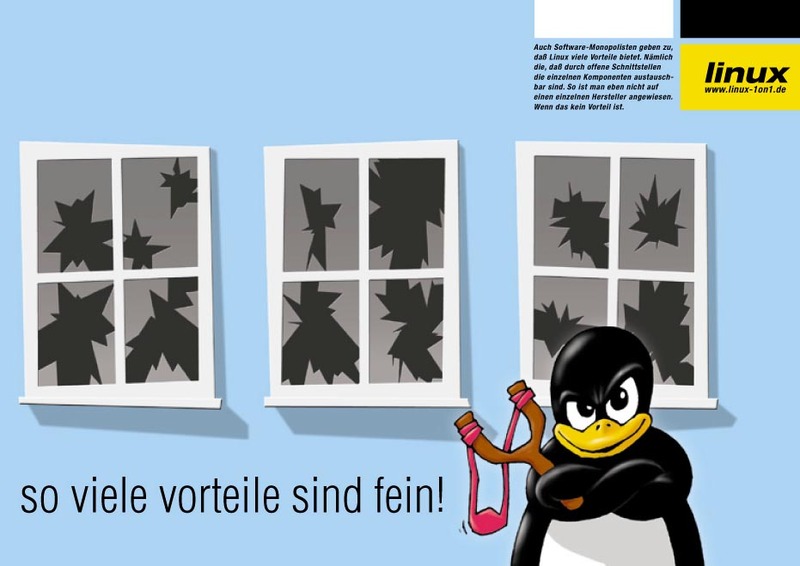 This comes from the The Penguin Liberation Front. Funky, dancing, and cute. This comes from the Linux for the PowerPC web site. This penguin comes equipped with an umbrella, which is appropriate for rainy Portland Oregon. This comes from the Linux Northwest Conference & Expo. 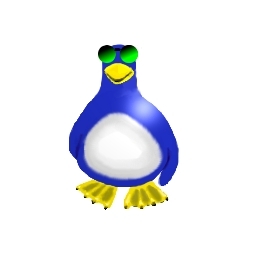 This penguin comes from the Beowulf project which is a 16 node Linux system which acts as a single computer to the user in order to fashion a cheap supercompter. This is used at some NASA sites. 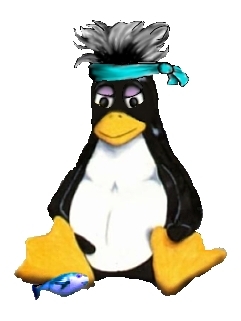 This penguin comes from the Topcat project which is a multiprocessor Linux system. Frankenwulf: From Southwest Research Institute in San Antonio, Texas. They have a 4 node beowulf cluster for test purposes made up of any old computers they had available. Frankenwulf is a mix of Frankenstein and Beowulf. Thanks to Javier Ayala for this image. 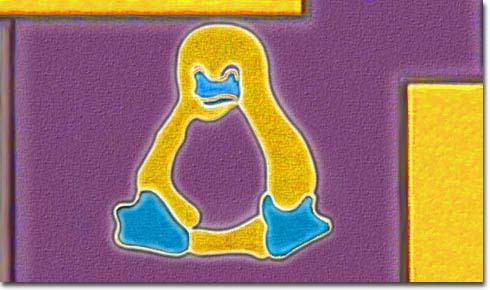 Penguin on an IC: Thanks to Tom E Arnold for pointing this out. 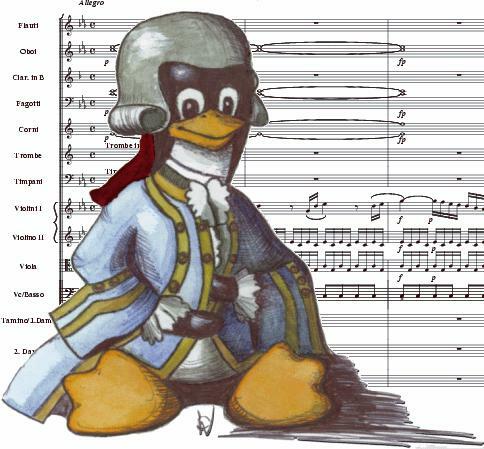 Note how they presented the shadows of the penguin? Just where is the light source? Oh well, it is MicroSoft. Maybe in penguin v1.1. It appears that their complaint is that you get different things with different distributions of Linux, and MicroSoft always distributes the same few pieces with their operating system, so you know what's on a standard M$ system. It isn't sufficient to get anything done, so people have to add random things to get a useful system, but all systems are the same. Interesting difference. Mostly, Linux caught their attention as something that needs to be slammed because it is cutting into what they think is their market. If you cannot compete in robustness, you can at least do the FUD trick and call names. (Big caption) so many advantages are a good thing! 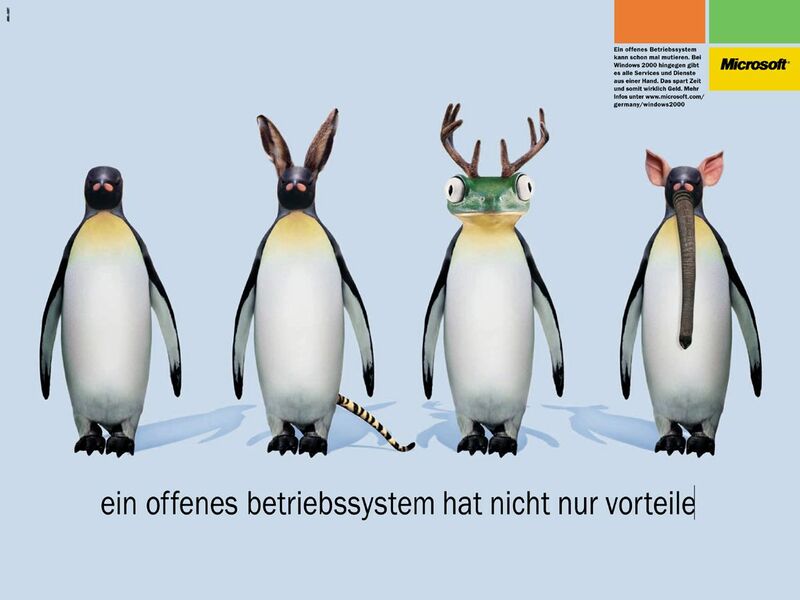 (The small print reads) Even software monopolies admit that Linux has many advantages. Namely, that, due to an open source philosophy, the individual components are interchangeable. In this way, there is no dependence on one source. And is that not an advantage? I have been collecting these images for my perversity. I am looking for additional information. If you know of any of the following information, let me know. Other penguins which should be here. One of these shouldn't be here. Better descriptions, or a better explanation of what a particular penguin is supposed to represent.